This week marks the beginning of the Florida legislative session and today is the celebration of International Women’s Day. 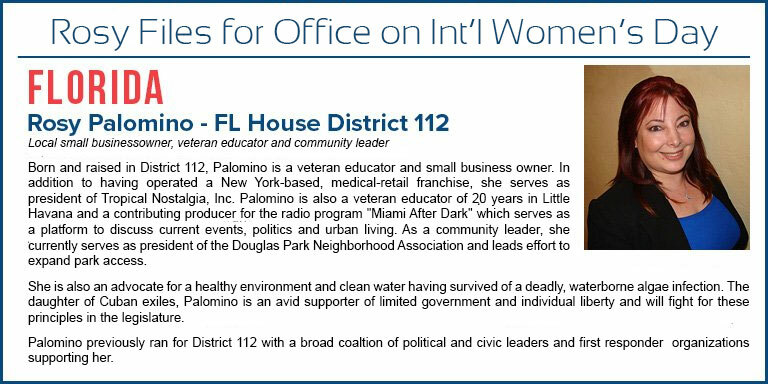 Rosy Palomino, the 2016 Republican candidate for Florida’s 118th State Representative Seat filed today for the 2018 race against the current incumbent, freshman Representative Nicholas X Duran (D-Miami), a non-profit executive. Palomino’s 2016 campaign received a groundswell of support from the local leaders as well as attention from state leadership in a hastily organized campaign prompted by the vacating of now State Senator Jose Javier Rodriguez, who previously held the 112 seat.